About halfway between Los Angeles and San Francisco on California Route 1 stands the Hurst Castle. While William Randolph Hearst himself perhaps made the drive up from LA or down from SF in a Dusenberg with some aspiring starlet in the passenger seat, I'm on a bit less of an imported marble floors and tigers in the backyard budget than was Mr. Hurst. If linoleum was still around my kitchen floor would be layered with it. I'm happy to drive anything on Route 1, with or without starlet. Ending up closer to Chin Ho, McGarrett, and Dano than Charles Foster Kane, I had been supplied a vehicle by the Ford Motor Company on this trip. In this case a Focus. The odd thing is that for years I had requested a Focus by name at rental car counters only to be handed the keys to a Neon, or similar. At last I had achieved a PZEV powered 2007 Ford Focus equipped with a sport appearance package and a set of SVT wheels fitted with wicked sticky Pirelli tires for road handling amusement. Getting out of Los Angeles can be the hardest part of any road trip, and to this end the Focus was on its best behavior. Research into the inner workings of the Focus revealed that a dual-mass flywheel is at the heart of the buttery smooth manual transmission action. This particular type of flywheel adds smoothness to the vibrations inherent in gear banging. Bonus to the drivetrain in traffic. Once clear of Ventura it also became apparent this Focus was equipped with a sunroof. Because we like the free wind blowing though our hair, and since the days surround the daylight there, I hit the open button and the throttle simultaneously while carefully avoiding Ford cousin Crown Vic hiding behind hills. I was on my way to the visit Oakland, the tougher brother of San Francisco. From Oakland it was off to West Point in California's Gold Country then back to LA. Upon reaching the good part of Route One between San Luis Obispo and Monterey, I discovered the State of California was also on a linoleum budget. With those craters what I needed was a moon rover, but the Focus held contoured lines without unexpected drama. Pedal placement allowed for smooth heel-and-toe footwork and horsepower delivery. The star of this iteration of Focus is what's known as the PZEV engine. Before this drive the origin of PZEV was of great mystery to me. Every one of our vast army of market research and photography assistants asked what PZEV was, and why there was a little green leaf on the hatchback lid. The translation of the acronym is simple enough, but the real story of the leaf has to do with double-cheeseburgers and hydrocarbon emissions. PZEV stands for Partial Zero Emissions Vehicle. According to Ford, the grilling of one hamburger out-of-doors emits more hydrocarbons than running the PZEV equipped Focus down the road for three hours, or 180 miles. 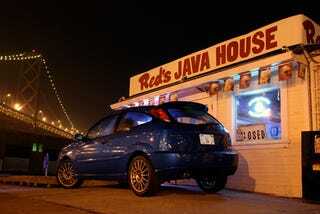 Famous for a unique double-cheeseburger served on a crispy-yet-forgiving San Francisco sourdough roll and sitting under the Bay Bridge is Red's Java Hut. Thanks to PZEV, I could have in theory driven the Focus from SF to LA with less environmental impact than lunch at Red's. This is to say nothing of the gastrointestinal impact of a double-cheese from Red's may impart. Unfortunately Red's was closed so we could not test the theory. Another strong point is the PZEV's rated 37 mpg on the highway. The PZEV engine's genuine triumph is that it emits less airborne nasties than some hybrids. Think of it as a refinement of an internal combustion engine with emphasis on clean burning operation. The California Air Resources Board holds the measure of this standard in Byzantine complexity. Beyond being an emissions champion, the PZEV engine delivers its horsepower smoothly hitting a peak 130 ponies at 6000 rpm. There is not an abundance of power but there's not a lack either. Delivery of the power was key for the next leg of the trip. Leaving Oakland I cut a loop into the Sierra Foothills to see an old pal. This latter part of the loop brought the bonus of traveling on some of the finest driving roads in California. State Highway 26 is highly recommended craterless Gold Country motoring. On the way up I carved the good part of the road twice, missing the turnout to West Point intentionally. While hanging out indoors sudden a winter storm moved in and coated the road with a wet carpet of pine needles. These needles in concert with pitch darkness and sideways rain made for some interesting driving on the trip down out of the hills. Imagine driving on a wet surface of toothpicks impregnated with synthetic oil and you pretty much have it. After a few hours of driving in tunnels on a somewhat crunchy two-lane slip-and-slide, the hours of ennui that is Interstate 5 was oddly welcoming, even with the descending sheets of rain. A long drive in a short wheelbase car is never an exercise in luxury, but the Focus put away the miles in a surprisingly forgiving fashion. Even so the Focus left me wishing for the couch like ride of cousin Crown Vic on the long highway of straight and time consuming. Cousin Vic, however, would not have achieved anywhere near the mileage of the PZEV powerplant. No matter. Art Bell, crackling in and out of ionospheric comprehension under the passing high tension wires, provided roadgoing entertainment. After a time I was convinced that vampires and perhaps space aliens were driving the trucks full of mail in front of me, and used the opportunity for passing tests. Six hours of cruise control later I was back in Los Angeles, having driven a Focus under the best and worst road conditions California could deliver. The car had held its center as a competent handling fun to drive econobox with an eye on the environment.